F-35A is the conventional take-off and landing (CTOL) version of the F-35 Joint Strike Fighter (JSF). Image courtesy of Darin Russell / Lockheed Martin. The aircraft's weapon station is comprised of six external pylons on wings with a capacity of 6.8t and two internal bays with two pylons each. Image courtesy of Paul Weatherman / Lockheed Martin. The F-35A took its first external weapons test mission at Edwards Air Force Base, California, in February 2012. Image courtesy of Paul Weatherman / Lockheed Martin. The first night flight was undertaken at Edwards Air Force Base in January 2012. Image courtesy of Tom Reynolds and Darin Russell / Lockheed Martin. F-35A flying above the compass rose of Rogers Dry Lakebed at Edwards Air Force Base. Image courtesy of Paul Weatherman / Lockheed Martin. The F-35A Lightning II stealth fighter aircraft is being manufactured by Lockheed Martin for USAF. Image courtesy of Liz Kaszynski / Lockheed Martin. The F-35A is the conventional take-off and landing (CTOL) variant of the F-35 Joint Strike Fighter (JSF) or F-35 Lightning II fighter aircraft. The single-seat, single-engine fifth-generation F-35A was designed and developed by Lockheed Martin Aeronautics for the US Air Force (USAF) and allied air forces. The multi-role, supersonic, stealthy fighter aircraft is designed to undertake air defence, ground attack and reconnaissance missions. The F-35A replaces the USAF’s F-16 Fighting Falcon fighters and will supersede A-10 Thunderbolt II attack aircraft by 2028. It is also expected to replace F-15 fighters. In addition, the F-35A complements the F-22 Raptor air superiority fighter. The F-35A CTOL variant of the F-35 aircraft is designed mainly as a low-visibility aircraft with air-to-ground attack and air-to-air combat capabilities. Turning agility of the aircraft is nine times the force of gravity. The F-35 Lightning II joint strike fighter (JSF), is being developed by Lockheed Martin Aeronautics Company for the US Air Force, Navy and Marine Corps and the UK Royal Navy. The F-35A is more affordable as its operation and support is expected to cost 40%-50% less than current-generation aircraft used by the USAF. Another affordability feature of the aircraft is that approximately 80% of its parts are common to other variants of the F-35 aircraft. Low visibility capability allows the aircraft to defy, retort and avoid enemy threats. State-of-the-art electronic systems add to the positional awareness of the pilot. Low-radar profile helps in maintaining the aircraft’s low visibility by allowing loading of weapons and fuel internally. Due to its lower logistics footprint, the aircraft can be positioned in an easier way than the USAF’s existing fighter aircraft. The critical design reviews (CDR) for CTOL variant of the F-35 aircraft were conducted in February 2006. The first flight of F-35A was undertaken in December 2006. The initial production order for two F-35A aircraft was sanctioned in April 2007. A slightly improved version of the original aircraft was flown in November 2009. 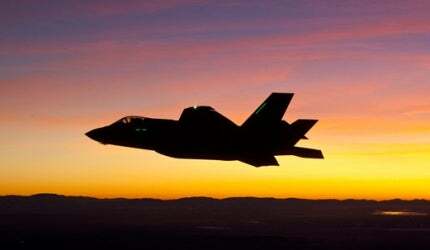 The first night flight of F-35A was carried out in January 2012. The aircraft was tested with external weapons for the first time in February that year at Edwards Air Force Base, California. First night re-fuelling mission was completed one month later in March, while the first in-flight re-fuelling mission was completed in April 2012. In December 2011, the Japanese Air Self-Defence Force selected the CTOL variant to replace its ageing F-4 fleet. Israel has also shown interest in buying at least 100 F-35A aircraft. The first two production aircraft were handed over to the USAF in May 2011. Two more F-35As were delivered in September 2011. The fifth and sixth aircraft, designated as AF-12 and AF-13 respectively, were delivered to the 33d Fighter Wing at Eglin Air Force Base in October 2011. The F-35A achieved initial operational capability (IOC) in August 2016. The US Department of Defense (USDOD) has planned to acquire 1,763 F-35As by 2034. The F-35A is equipped with an internally-mounted GAU-22/A Equalizer gun manufactured by General Dynamics. This 25mm gun is designed for greater effectiveness against ground targets. "The US Department of Defense (USDOD) has planned to acquire 1,763 F-35As by 2034." The aircraft’s weapon station includes three external pylons on each of the two wings with a combined capacity of 6,800kg. Moreover, there are two internal bays with two pylons each with a combined payload capacity of 8,100kg. Northrop Grumman Electronic Systems’ AN/APG-81 Active Electronically Scanned Array (AESA) radar is used in the aircraft, as well as the AN/AAQ-37 Distributed Aperture System (DAS) missile warning system, which is fitted with six electro-optical sensors. In addition, an electronic warfare suite, designated as AN/ASQ-239, is supplied by BAE Systems and a Multifunction Advanced Data Link (MADL) communication system is provided by Harris Corporation. In October 2015, BAE Systems placed a $51m order with Cobham to supply microelectronic products for the F-35 Lightning II. The 15.7m F-35A aircraft can fly at a maximum speed of 1.6 Mach. The combat radius and maximum range of the aircraft on internal fuel are 1,093km and 2,200km respectively. Maximum g-rating of F-35A is 9.0 and weapons payload capacity is 8,160kg. The F-35A CTOL is powered by a single F135 engine (F135-PW-100 variant) manufactured by Pratt & Whitney. The F135 is a two-spool afterburning turbofan type engine capable of producing maximum thrust of 191.3kN and intermediate thrust of 128.1kN. The F135 engine is an enhanced version of the F119 engine which powers the F-22 Raptor. F135 measures 135m in length and has an inner diameter of 1.17m. Overall pressure ratio of the engine is 28. Internal fuel capacity is 8,382kg. Eglin Air Force Base (EAFB) is a military training base located 4.8km south-west of Valparaiso, Florida, US. Edwards Air Force Base (EAFB) is situated 11km south-west of North Edwards, California in the US.